Singapore Airlines Business Class Review Written by Mark Smith. Published on 11th February, 2019 . 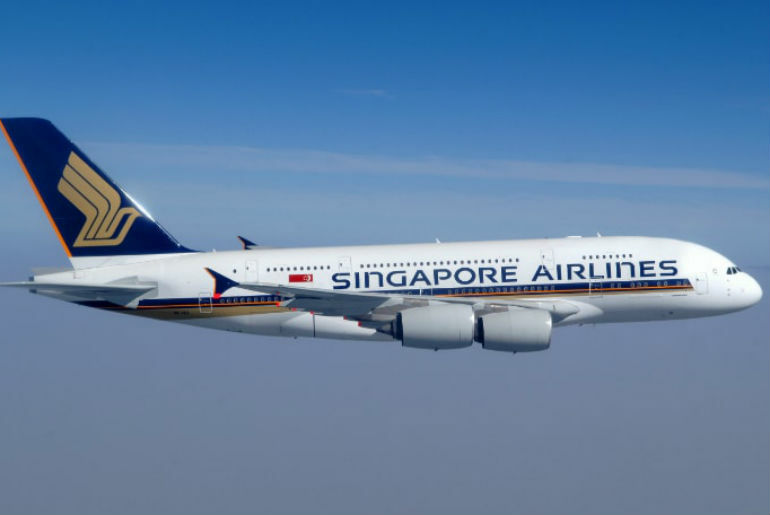 It’s been 12 years since the maiden voyage of the A380 and the revolutionary Singapore Airlines business class that was found on board, but in that time a lot has changed in the aviation industry. The introduction of sleeker, more fuel-efficient aircraft has meant airlines have focussed on these models, often leaving passengers with what feels like an obsolete and outdated business class experience. That is all changing again though, with passengers excited by the rejuvenation of the superjumbo spearheaded once again by Singapore Airlines and their team of designers. Rolling out a new business class cabin across its entire fleet of 19 Airbus A380s by the end of 2020, the Singapore Airlines business class has already garnered accolades, picking up titles such as Best Airline Business Class and Best Airline for Business Travellers Worldwide from Business Traveller, as well as the prestigious Best Airline in the World from Conde Nast Traveller. It was high time to see if all the hype was founded, so here is my Singapore Airlines A380 Business Class Review! It seemed like only a month ago I had finally locked in my dates. My long-awaited trip to Australia to visit family had come around quickly, but as with any flight from the UK to Australia I was dreading the amount of time it would take to get there. That’s why I decided to fly on one of the world’s best airlines, in the Singapore Airlines business class on their morning A380 flight, SQ317. Arriving at the Queen’s Terminal at Heathrow, check-in was a breeze. For first-time business class passengers with Singapore Airlines, make sure to ignore the long winding queues at the departure hall and make your way behind the normal check-in area to the dedicated business class desks. Not only do you not have to wait as long, but you also don’t have to deal with a computer issuing your boarding pass. Instead, the very polite and accommodating Singapore Airlines staff help you with your bags and ensure that you know where you are going to make the most of your business class flight. Once again wanting to skip the queue, I made a beeline for the FastTrack security lane and was through airside in the blink of an eye. Unfortunately, I was now up for the long walk to Terminal 2B as all Singapore Airlines flights depart there, and subsequently, the SilverKris Lounge is through the concourse close to the relevant gates. 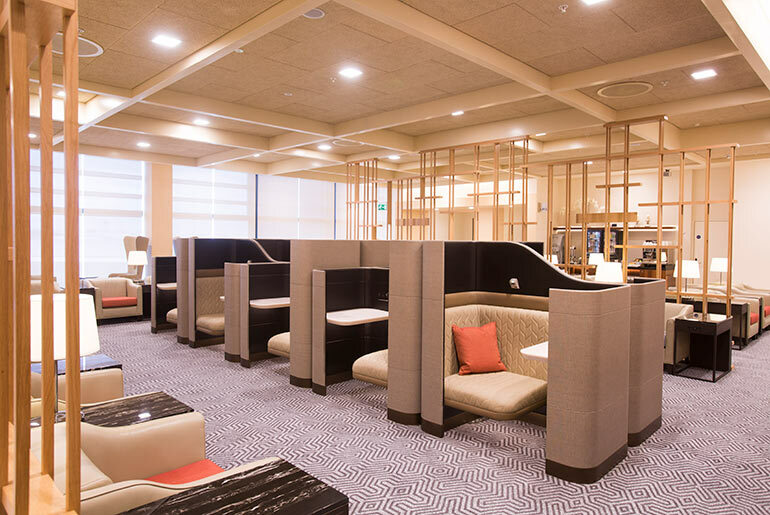 Accessed via a small entrance and then up a lift shared with Air Canada’s Maple Leaf Lounge, the Singapore Airlines lounge is accented by wood elements dividing the space into separate areas and providing a feeling of cosiness in what is a deceptively large space. Containing a bar area, complete with bartender and an acclaimed selection of alcoholic and non-alcoholic drinks, and a buffet offering a range of hot breakfasts in the morning and Asian inspired dishes after. There is also a cold buffet including salads, meats, cheeses, and desserts, the SilverKris Lounge ensured I could enjoy a light meal and beverage before boarding. Being a solo traveller, and preferring my own space, I loved the ability to slide into one of the private pods with a seat and table that offered privacy and comfort for dining or making use of the free Wi-Fi. Having already done the long walk to Terminal 2B, when the time came to board it was a quick and seamless affair with priority boarding directly onto the upper deck. Unlike other variants of the A380, the upper deck is reserved exclusively for first and business class passengers, and first impressions of the new decor and design are impressive. 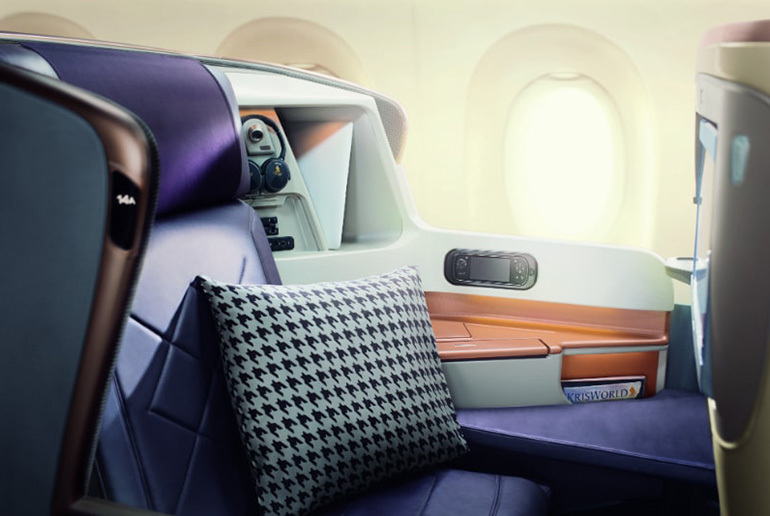 With purple and grey, and a hint of copper tones, the new Singapore Airlines business class seats resemble something more like a cocoon or a private suite than the wide, tan coloured seats of the older models. Greeted by the classic ‘Singapore Girl’, I made my way to my window seat 15K and found several storage spaces under the business class seat in front, great for keeping tablets or laptops for work or leisure. Settling into the seat, I found it was not just the seat casing that surrounds you. The seat itself is moulded slightly to provide support to your arms and sides and made the long journey more comfortable and easier to handle. The entire area made me feel more like I was travelling in first than business class. With a hot towel used and a beverage in hand, the exemplary service of the Singapore Airlines cabin crew shines through as I made myself comfortable and explored the seat functions. On all seats except the bulkheads the footwell is at a slight angle to the seat but remains comfortable and I never felt like I was twisting. To recline the seat into a fully flat bed is now done automatically at the push of a button, but for now, I was happy to recline. Ignoring the menu as I had made sure to ‘Book The Cook‘ before my flight, I relaxed and took in some viewing on the state of the art 18″ high definition entertainment system. It wasn’t long before food started arriving on fine porcelain and I enjoyed an appetiser of satay chicken and a cold antipasti selection before the main course. 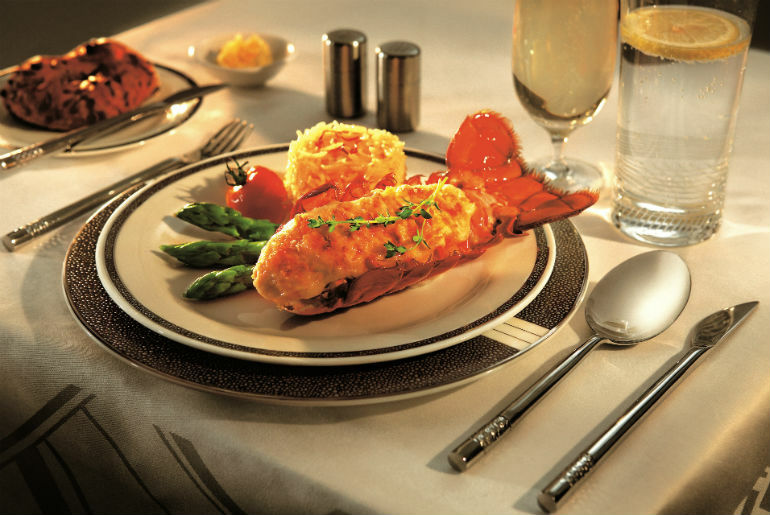 I had pre-selected the lobster thermidor which was succulent and served with asparagus and fingerling potatoes. Paired with a delicious New Zealand Sauvignon Blanc, I could not fault the cuisine. I had had my fill for lunch and decided to finish with a light serving of fresh fruit. After relaxing and enjoying some of the complimentary Wi-Fi, we were about 6 hours into the 13 hour flight time and due to the time differences, it was already dark outside so wanted to catch a few hours before arriving into Singapore. Standing to turn my business class seat into a fully lie-flat bed with the touch of a button, the lack of side storage compartments now makes a lot of sense.  It means that when laid down as a bed I didn’t feel constricted by parts of the seat jutting out and confining my movement. After a few hours, I woke and made use of the Penhaligon’s amenity kit before enjoying the Asian breakfast of pad thai that I had ordered on Book The Cook. With the seat in the upright position, we landed on time in Singapore just before 7am. With the upper deck of the A380 disembarking first, I was bid farewell by name from the crew who had provided such a fantastic service throughout the flight. Transiting through Changi Airport, the best airport in the world, I didn’t need to make use of the priority baggage that Singapore Airlines business class passengers receive, so instead made my way through the transit area and into the fantastic SilverKris Lounge in Terminal 3. That though, is a review for later! ***Edit: One thing I wasn’t aware of on the outbound journey but found out about on the return is that when you transit through Changi Airport on Singapore Airlines flights in both directions you can claim a SD$20 voucher per person to use at selected stores in the airport. Perfect for those looking to pick up some duty free items, this offer is seemingly valid for a limited time. Singapore Airlines also offer a free city tour for those that have a longer connection time and don’t want to spend hours in the business class lounge. All up, I have to say that Singapore Airlines new business class on their A380 completely lives up to the hype! The re-imagined design is breathtaking and I felt that the new seats were a significant improvement. Although slimmer than the original design, the space feels intimate and contemporary.  An additional benefit for couples or a parent with a small child travelling together is the ability to book the middle bulkhead seats where the divider can be dropped completely. This then allows for the seats to recline into fully flat beds that are almost a double bed. 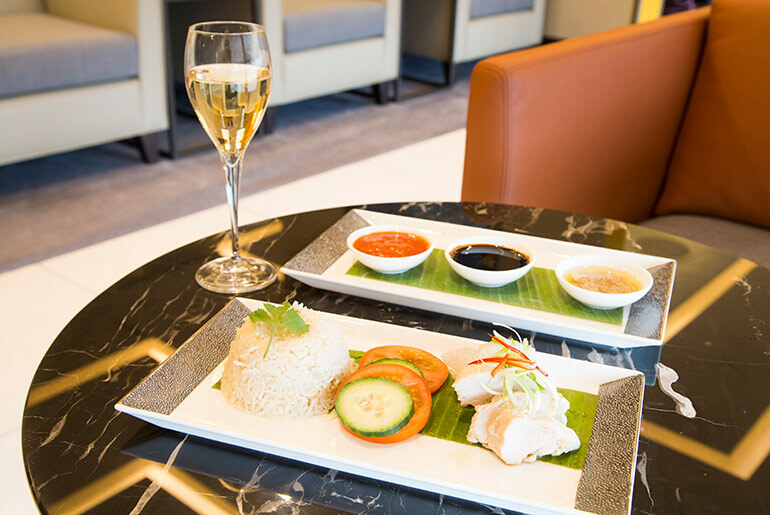 So, from the new business class cabin, to the impeccable service, to the amazing lounge facilities, to the additional touches at Changi Airport, Singapore Airlines business class is once again at the pointy end of the airline industry. With connections to Australia, Asia, New Zealand and the Pacific Islands, and the ability to build round-the-world fares through their association with the Star Alliance, I highly recommend trying the new Singapore Airlines business class on your next trip. Want to know more about Singapore Airlines world class offering?  Call us today on 020 8417 1366 and let’s talk about your upcoming travel plans!